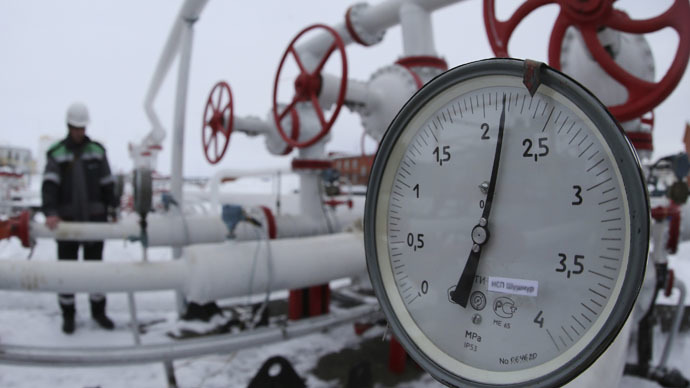 Naftogaz of Ukraine has started counting the Russian gas supplied through the Prokhorovka measuring station on the border of Russia and the self-proclaimed republic of Lugansk, as part of its contracted purchase. Ukrainian Naftogaz received 22,781 million cubic meters of gas from Gazprom on March 2, 11,466 million of which went through Prokhorovka, as RIA quotes Ukrtransgaz. At the same time no gas was pumped through the Platovo station on the border of the Russian Federation and the Donetsk region. On March 1 Naftogaz refused to take gas supplied through the Donbass measuring stations, saying the gas had to come through the Valuiki, Sokhranovka, Pisarivka and Sudja stations on the Russian border with Ukraine. On that day Ukrtransgaz received 4,477 million cubic meters of gas from Russia. Kiev cut off gas supplies to the south east of Ukraine on February 19, explaining it was because of damage to pipelines as a result of fighting in the Donbass. On behalf of the Russian government Gazprom then started using the Prokhorovka and Platovo stations on the border of Russia and the Lugansk and Donetsk republics to supply gas to the region. Gazprom said gas supplied to Ukraine through the stations was in accordance with the Naftogaz contract. Naftogaz, in turn, said the deliveries were contrary to the agreement, blaming Gazprom for breaching it and delivering less gas than Ukraine had requested. Ukraine is running out of the Russian gas it prepaid in December, as the so-called 'winter package' expires at the end of March. Last week Russia warned Kiev that if it fails to make new advance payments, its gas supplies would stop this week. On Friday Naftogaz paid $15 million to Gazprom, enough to cover 24 hours worth of consumption. However, at the time of publication Gazprom hasn’t announced a gas cut. Ukraine’s Naftogaz owes Gazprom $2.4 billion for deliveries, including $200 million in penalties, according to Russian Energy Minister Aleksandr Novak. He added that Russia is considering a possible discount to Ukraine in what’s described as a 'summer package'. The ‘winter package’ sealed last October fixed the price at $378 per 1,000 cubic meters. However, a drop in the cost of oil led to lower prices, with gas now supplied to Ukraine at $329. On Tuesday, Alexander Novak called for Naftogaz to restore gas supplies to the Donbass region, adding that Kiev made “cunning” statements on delivering gas to the region. The day before, energy ministers of Russia and Ukraine held talks in Brussels with the Vice President of the European Commission for Energy Maros Sefcovic. As a result, Russia and Ukraine decided to exclude supplies to Donbass from the earlier agreed Ukrainian ‘winter package’.